What Day Of The Week Is October 24? 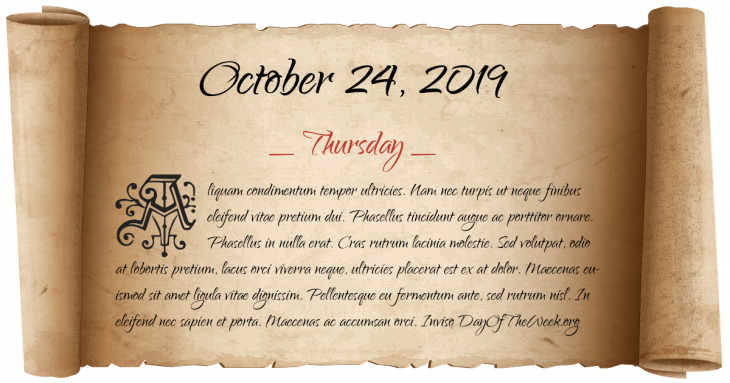 October 24, 2019 is the 297th day of the year 2019 in the Gregorian calendar. There are 68 days remaining until the end of the year. The day of the week is Thursday. Saif ad-Din Qutuz, Mamluk sultan of Egypt, is assassinated by Baibars, who seizes power for himself. The Treaty of Brétigny is ratified at Calais, marking the end of the first phase of the Hundred Years’ War. John White, The governor of the second Roanoke Colony, returns to England after an unsuccessful search for the “lost” colonists. Napoleonic Wars: The Battle of Maloyaroslavets takes place near Moscow. William Lassell discovers the moons Umbriel and Ariel (moon) orbiting Uranus. Battle of Caporetto; Italy suffers a catastrophic defeat by the forces of Austria-Hungary and Germany on the Austro-Italian front of World War I (lasts until 19 November - also called Twelfth Battle of the Isonzo). The George Washington Bridge opens to public traffic. The USAF starts the X-20 Dyna-Soar program. Who were born on October 24?